Nvidia has surprised industry watchers by releasing a new graphics driver branch dubbed the Nvidia Creator Ready Driver. 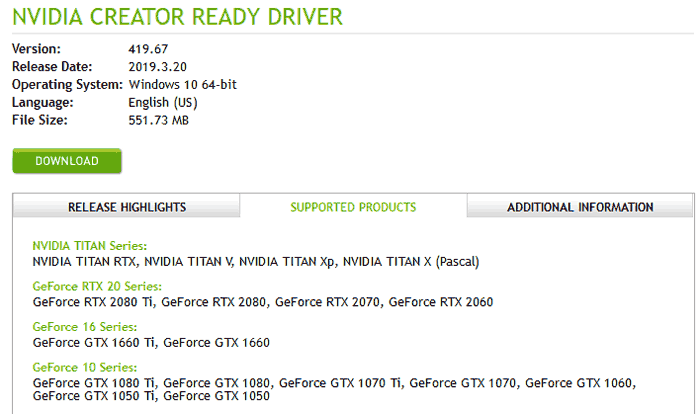 These drivers are for GeForce 10 series and newer consumer graphics cards (or Pascal Titan and newer). They aren't aimed at 'pro' creators with systems packing Nvidia Quadro products (which have their own certified drivers), but seem to be 'enthusiast' creator level drivers. The new drivers could form a welcome middle-path for creatives who are not yet ready or otherwise inclined to invest in the Nvidia Quadro range. "Creators are constantly faced with tight deadlines and depend on having the latest hardware and creative tools to complete their projects on time, without compromising quality," said Eric Bourque, senior software development manager at Autodesk. "We're excited that Nvidia is introducing a Creator Ready Driver program because it will bring Arnold users an even higher level of support, helping them bring their creative visions to life faster and more efficiently." 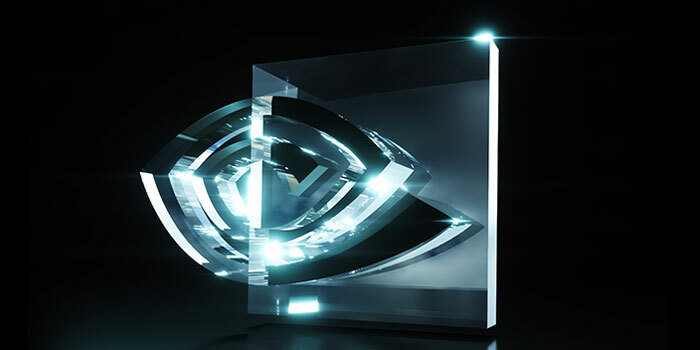 The first Nvidia Creator Ready Driver is version 419.67 and is available to download for Windows 10 64-bit at the link above. 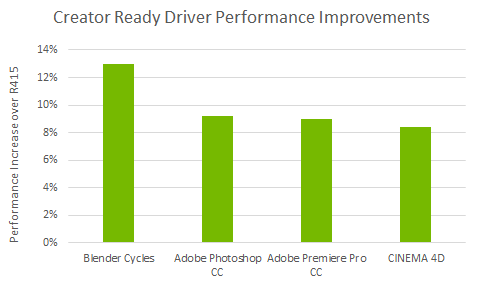 In the accompanying release notes (PDF), Nvidia says that these driver releases "are timed to key creative application updates, ensuring the best compatibility and performance for those who depend on PCs for their creative work." You will notice the version numbering aligns to the regular GeForce Game Ready drivers. The improvements in applications listed above are in comparison to "the previous driver branch". 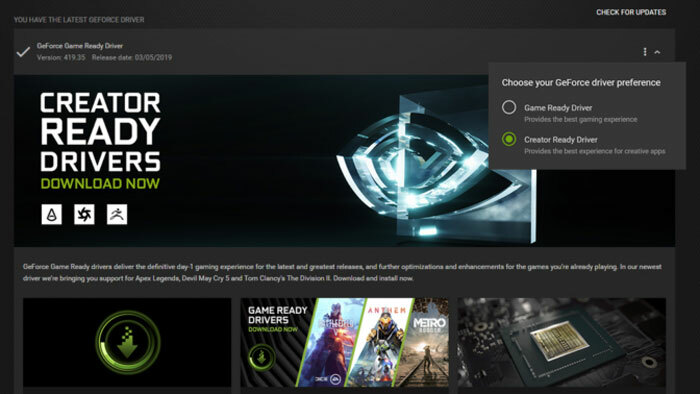 When you go to the Nvidia driver search page you will notice that as well as product type, series, product, OS, driver type and language you now have to select the dropdown menu to choose Game Ready Driver (GRD) or Creator Ready Driver (CRD). Nvidia offers some brief advice to help you choose GRD or CRD, it says that "all Nvidia drivers provide full features and application support for top games and creative applications." However you will choose by following the following criteria: "If you are a gamer who prioritizes day of launch support for the latest games, patches, and DLCs, choose Game Ready Drivers. | If you are a content creator who prioritizes stability and quality for creative workflows including video editing, animation, photography, graphic design, and livestreaming, choose Creator Ready Drivers." It will be interesting to see how often the Creator Ready Drivers get updated compared to the gaming ones in the coming months. At this point in time one would expect GRD and CRD gaming performance on a par with each other in games but CRD updates could lag behind given the slower pace of the creative application industry and Nvidia having to thoroughly test for application stability. Got to love how NVIDIA keep creating their own competition in the Professional market. The gap between high-end GTX cards and Quadro cards just keeps getting smaller and the benefits of choosing professional over consumer keep getting less. So why do we need specific drivers for ‘creative’ programs…. couldn't they have just made drivers that automatically adjust the settings to suit the program that's running? We can already manually set custom graphic settings for individual programs so why can't they have a default ‘package’ we can use if we want…. Gotta agree with LSG501. All manufacturers' graphics drivers already do app detection for video games, so why can't they do app detection for non-game apps as well, enabling the various enhancements for productivity apps? Having two sets of drivers seems utterly ridiculous. I can see a case for “pro” drivers that come exclusively with “pro” graphics cards - it's a bit sickening, but makes business sense. Introducing a second free driver set for consumer cards just serves to muddy the waters for users. You have to think there must be quite a few users who both work *and* play on their computers - are they supposed to install one drivers set during the day, and the other at night? That does not bother NVIDIA as long as the price gap between the two markes also closing, meaning are getting more expensive every new generation.